If you are planning to spend your holidays in Sardinia, do not underestimate the idea to attend a course of kitesurfing: a healthy sport, in a direct contact with the sea, nature and … terribly adrenaline! 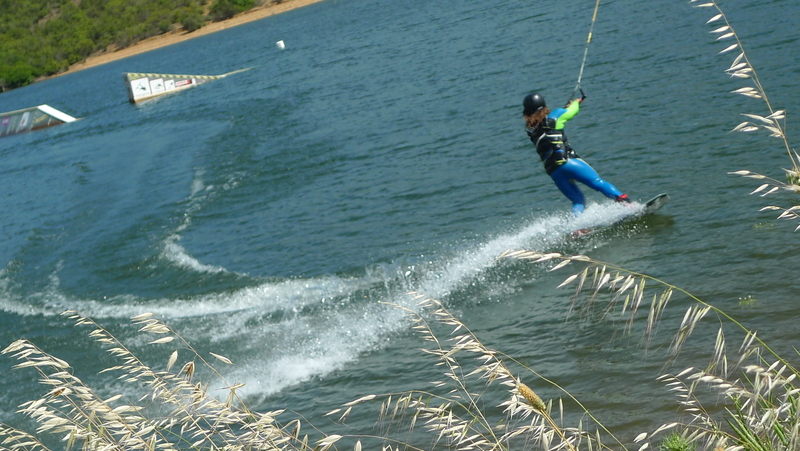 On thhis page you could understand where to Kitesurf in Sardinia and where to Learn to Kitesurfin Sardinia. In short, where to enjoy Kitesurf Sardinia. Now the questions are: Where to Kitesurf in Sardinia? In which kitesurf Sardinia spots where I can learn to Kitesurf? Sardinia, as well as being a beautiful country, rich in natural, cultural, culinary traditions and landscapes, has 1,897 km of coastline and is one of the windiest regions in Europe. Because of its location, in the center of the western Mediterranean, Sardinia is a very wind island where the most frequent winds are Mistral (NW) and Scirocco (SE). it is rich in great beaches, of which many are away from the bustle of the crowds of swimmers. 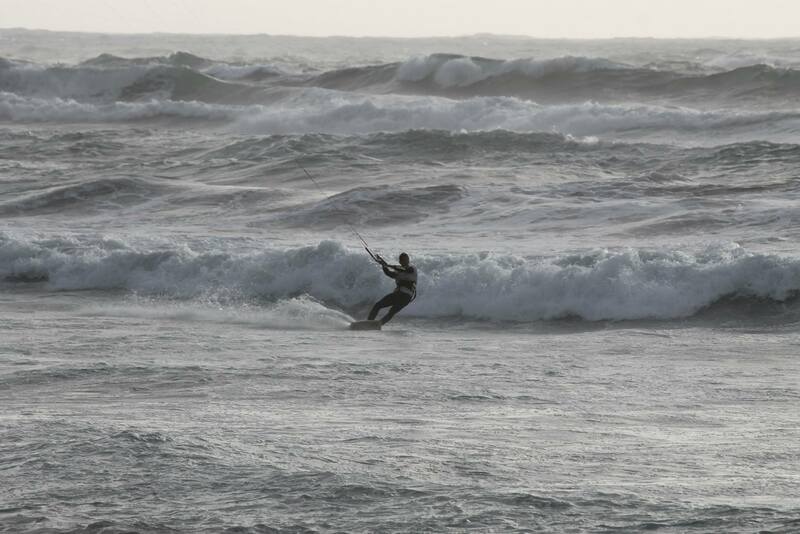 With this conditions, Sardinia can be considered a paradise for kitesurfing: Kitesurf Sardinia, one word! 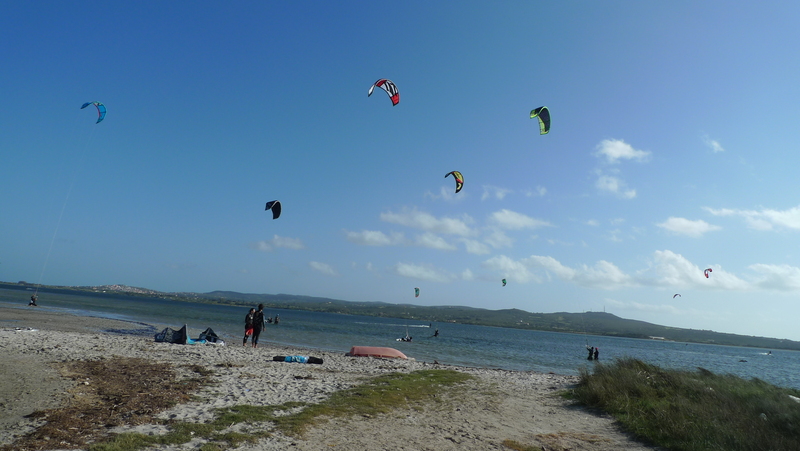 In Sardinia, you can therefore find many places that have the ideal characteristics for kiteboarding. 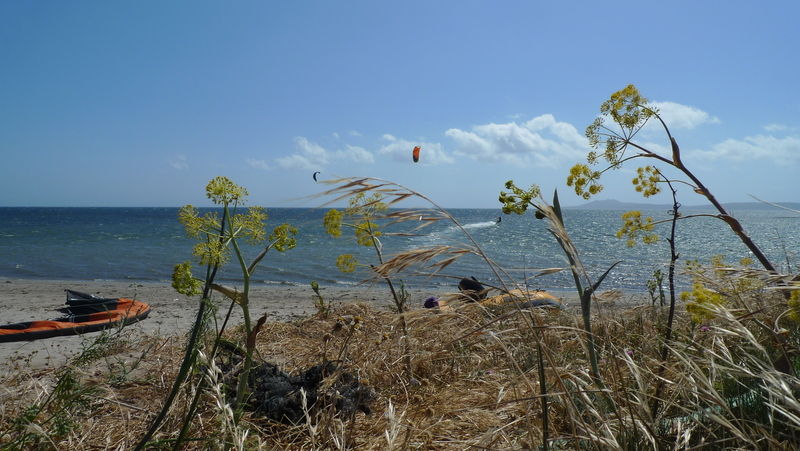 The south of Sardinia is probably one of the windiest coast of the Mediterranean and therefore rich in many Kite Spots: Poetto of Cagliari, Petrol Beach in Capoterra near Cagliari, Quartu Sant’Elena, Chia, Villasimius, Santa Margherita di Pula, Funtanamare, Porto Botte, Punta Trettu. 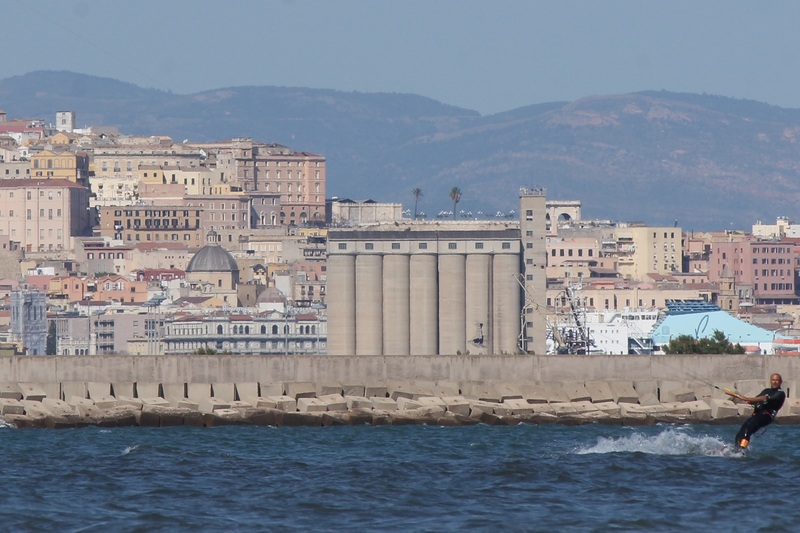 The main beach of Cagliari, Poetto, is perhaps the best known by tourists. It is between the Sella del Diavolo (Devil’s Saddle) and Quartu Sant’Elena. 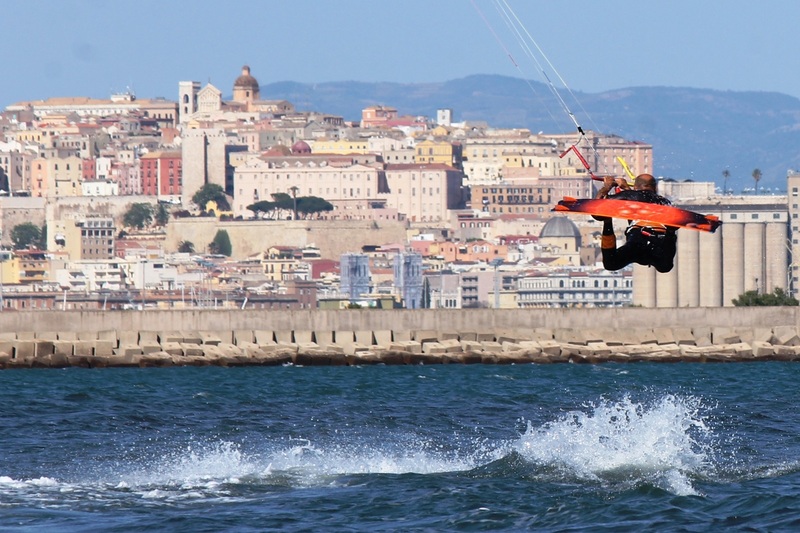 Besides being famous for its nightlife, it is also a great spot for kitesurfing: there is a lot of space, since Poetto is long approximately 10 km where Mistral, Scirocco and Levante blow almost every day. The beach is sandy and is easily accessible both by car and by public transport. At Poetto beach every year take place some kite events, as the Kite Foil World Championships 2017. To understand in which weather conditions and which kite lessons and courses are proposed in this Kite Spot of Sardinia, you can have a look at the Sardinia Kitesurfing Lessons page. La Maddalena Spiaggia better knows as Petrol Beach in Capoterra, blown in the summer months by Scirocco, Ostro and Thermic winds. On the hot days of summer it is an ideal spot for kite surfing, even for beginners. 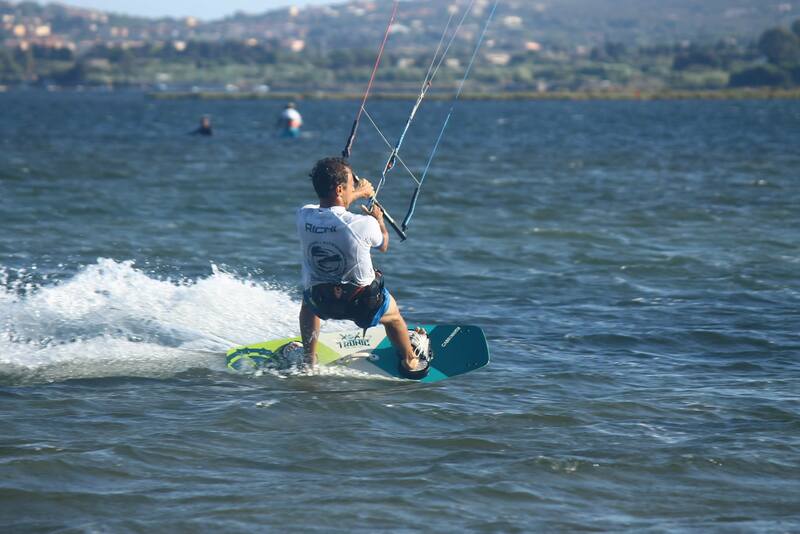 To understand in which weather conditions and which kite lessons and courses are proposed in this Kite Spot of Sardinia, you can have a look at the Sardinia Kitesurfing Lessons page. Another beach for kitesurfing, always in the south-west of Sardinia, is certainly the beach of Chia: white beach and crystal clear waters exposed to the Mistral and the south winds. Chia is a Kite spot for expert and for this reason kite lessons and courses are proposed just in some cases. 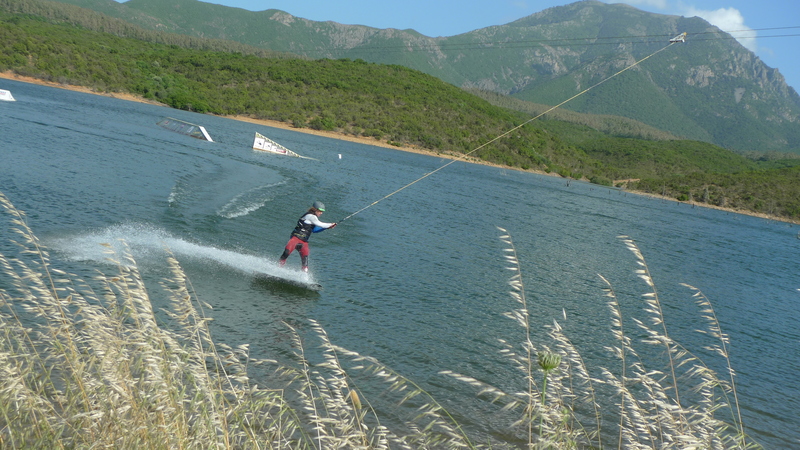 Also the bay of Porto Botte is another ideal place for kitesurfing, suitable both for beginners and experts. 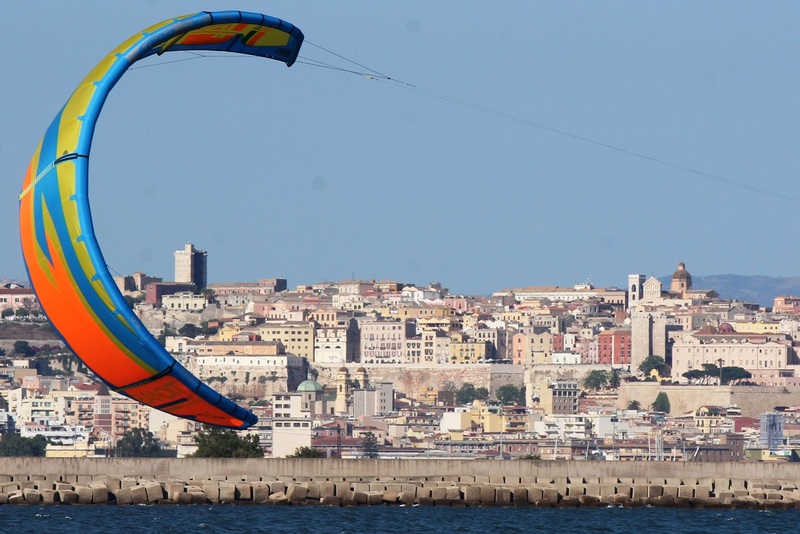 It is a long bay about 2 km where there are 3 sensational kite spots: Il Fortino, Porto Botte, Is Solinas. 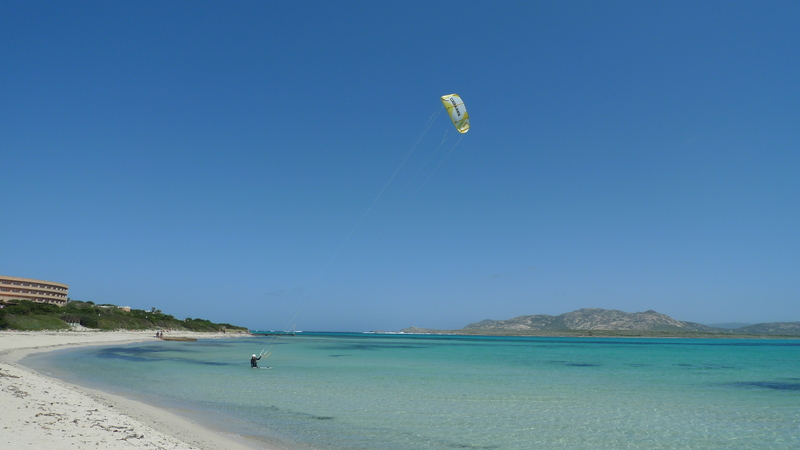 Among others, Punta Trettu, considered one of the best Kite spots in Sardinia. 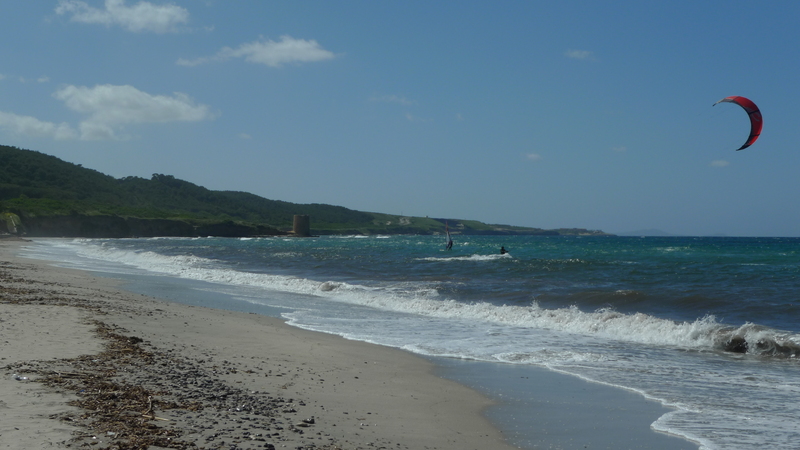 In fact, with shallow and flat water, Punta Trettu is a perfect Kite Beach especially for beginners: they can stand up and walk in case of need. A Kite Paradise! 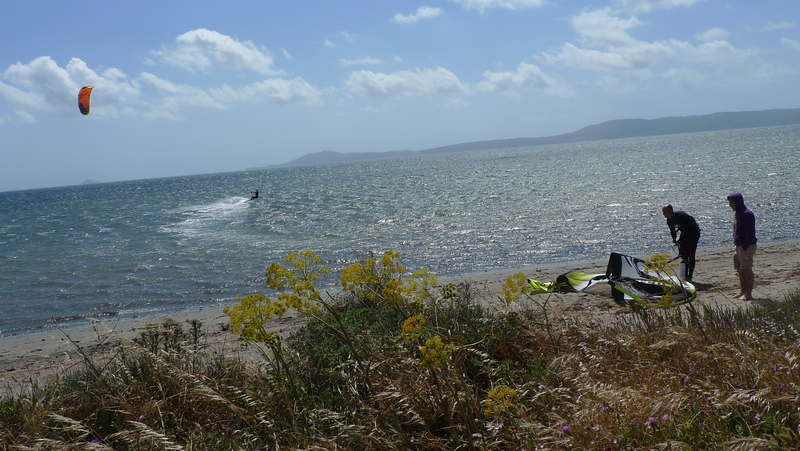 To understand in which weather conditions and which kite lessons and courses are proposed in this Kite Spot of Sardinia, you can have a look at the Sardinia Kitesurfing Lessons page. 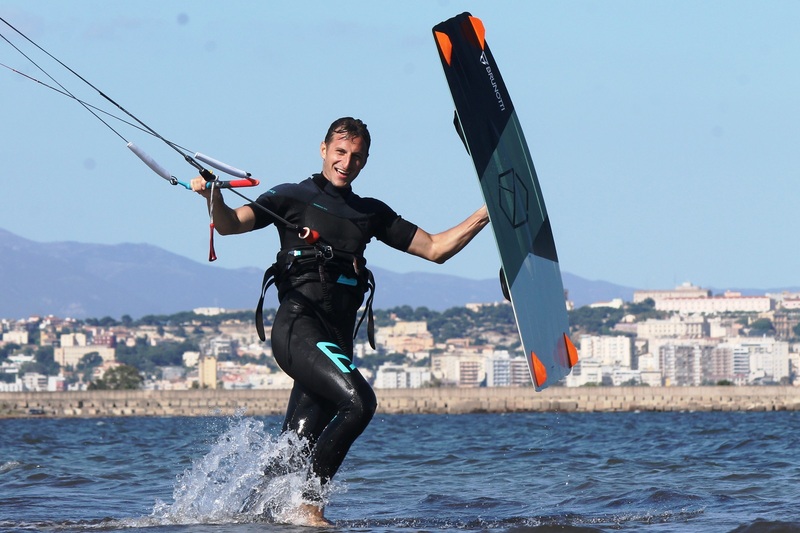 Kitesurf Sardinia: Which is the best Spot to kitesurf in Sardinia? As seen above, in Sardinia there are many spots for kitesurfing. Many people will wonder: but which is the best spot for kite surfing in Sardinia, the most beautiful, the one where the wind always blows? 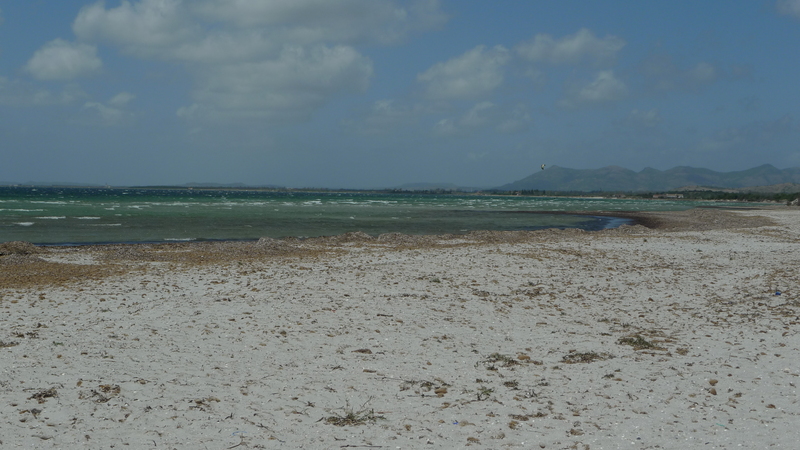 In Sardinia the wind direction changes very often. 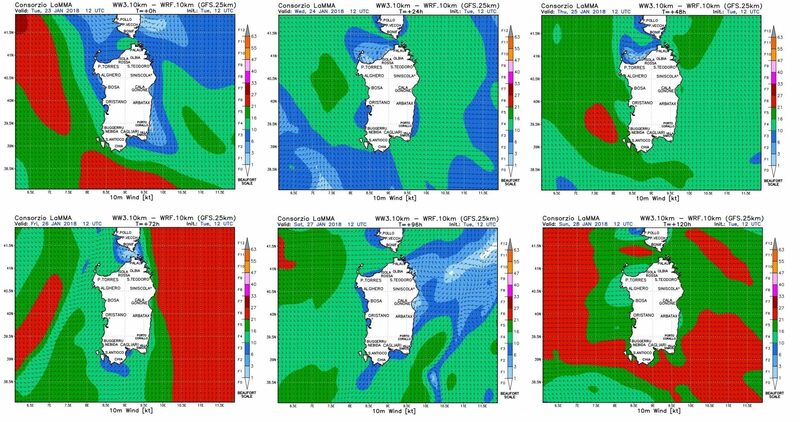 It may be that Mistral wind (north west, the best with Mistral are spots Porto Botte and Punta Trettu) or Scirocco (south east, the best spots with Sirocco are Poetto, Petrol Beach, Chia, Punta Trettu) for a whole week. Or it may be that the Mistral blows for a day, the day after will blow the thermic wind and then scirocco, Grecale or Libeccio (the best place with Libeccio are Geremeas and Villasimius). As example of what has been said above, you can have look at the following image: it shows the weather / wind forecast for the days of 23, 24, 25, 26, 27, 28 January 2018. 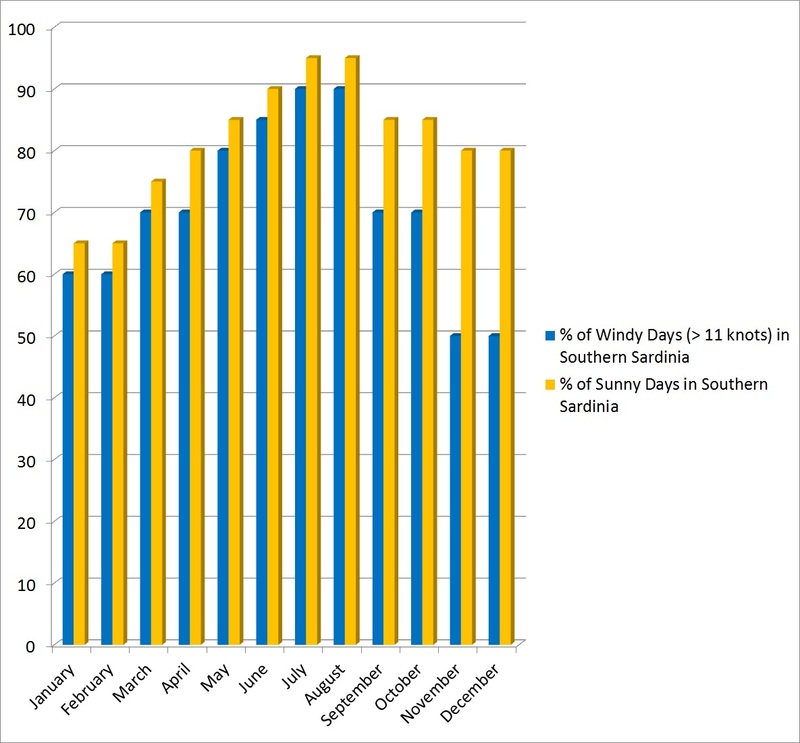 As you can see, in those forecasts the wind changes direction and intensity every day. So what to do? The suggestion is to contact a school as KiteGeneration, based in Cagliari and Punta Trettu that every day follow the wind in different Kite Spots. In all cases, it is strongly recommended to have a car to move in the different spots when wind changes direction. However, eye that, if you are not an expert on weather conditions of Sardinia, find the wind often can not be so simple. If you’re thinking about starting to practice kitesurfing, it is advisable to join a Kiteschool. In fact, when we start to learn a new sport, which also has a discrete component of risk as the kitesurf, it is really reccommended to rely on experienced teachers and avoid DIY. Moreover, even if you are already familiar with this great sport, it is important to know the right kitespots to practice it. For all these reasons, KiteGeneration, kite school founded by people that have turned their passion into a profession, is the ideal group for learning kitesurf in Sardinia: a well-organized kiteschool, ideal even for children, with highly experienced and professional instructors. 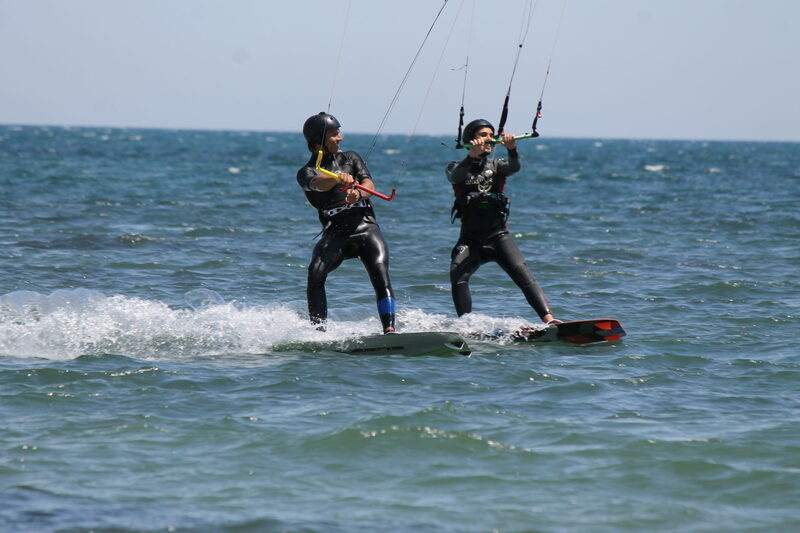 KiteGeneration’s Instructors will drive you step by step in learning this exciting and fun sport. All in breathtaking beaches and landscape of Sardinia. 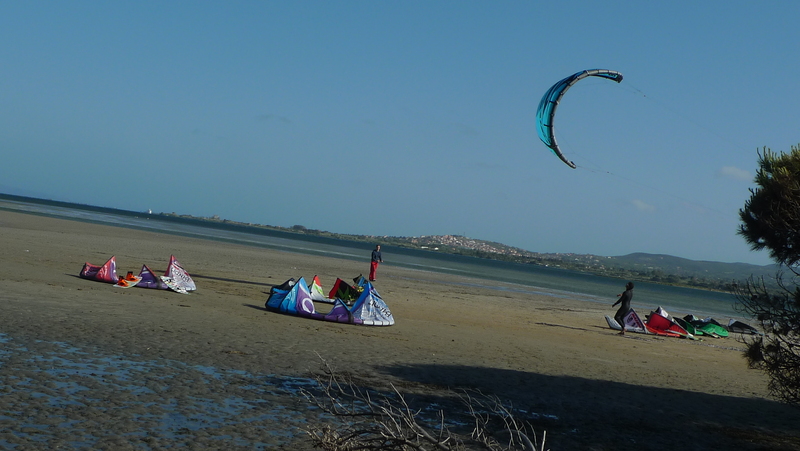 Don’t miss it, Enjoy Kitesurf Sardinia! The Cagliari Kite Beach of Giorgino is the first and, at the moment, the only kite area in the district of Cagliari, in Sardinia, where is possible to Kitesurf during the summer season. The Kite Area of Giorgino has been created and is managed, during the summer season, by KiteGeneration Kiteschool. 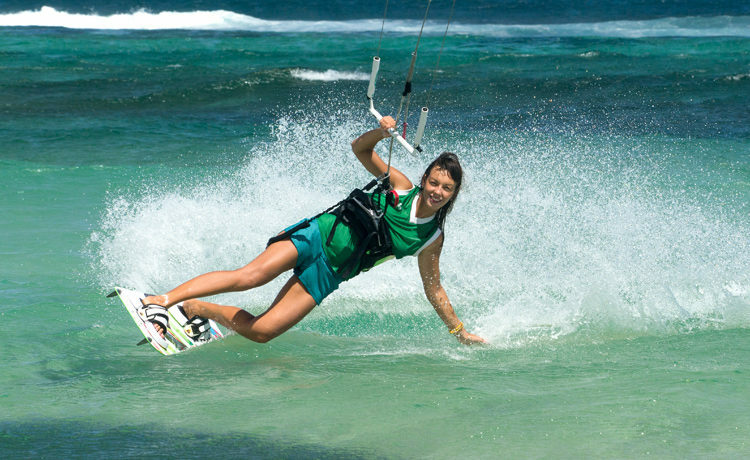 All Kiters must have an insurance specific for kitesurfing. If you are a Kiteboarding FIV affiliated, if you have a VDWS card for Kiteboarding or if you have any other card suitable for kitesurfing with insurance, that is fine. If you do not have a kite card with the above requirements, you need to do it. If you wish, you can subscribe to our Kiteschool and Sport Association with a fee of 25 euro: the fee will includes a Kite card with insurance (you can find the insurance coverage at this page) that can be used all over the world. The kiters that like to kitesurf at Giorgino Kite Beach must use the launch lane, both to get away from and to return to the beach. 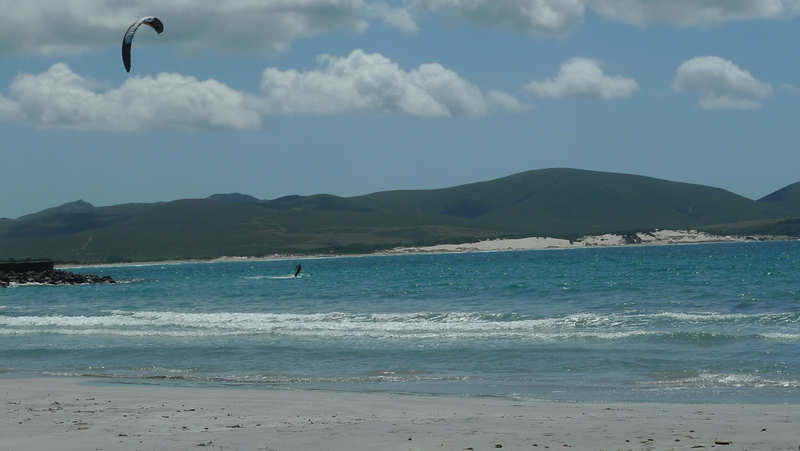 Once you will be at of the beach bu using the kite lane, you will have all the sea available for kitesurfing. In case the return to the beach can not be done by using the lane, because physical or technical problems or because no winds, to return to the beach must be done by using the body drag. Kiters not yet independents (ie: kiters that do not have good kite control, still unable to relaunch the kite from the water, that do not have a good body drag level, that do not know all the safety rules) must take kitesurf lessons until a proper kite level will be reached. Safety First of all! Kites shall be armed and landed in the proper area. 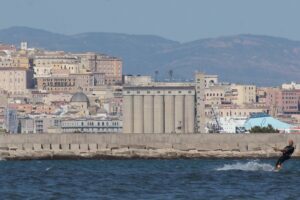 The Giorgino Kite Spot, called by the Kiters also Little George, is a kite spot located 5 minuter by car from the center of Cagliari, heading towards Capoterra, right after the new Canal Harbor. 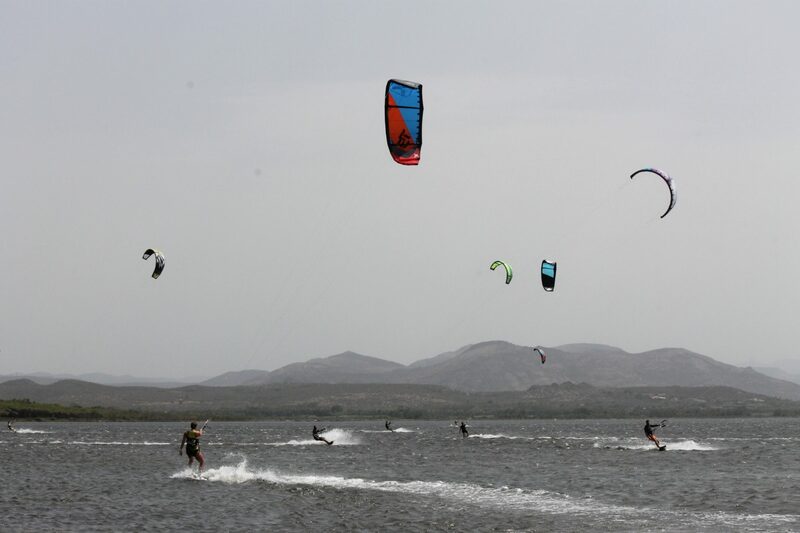 It is a perfect place for kitesurfing, especially with the thermal wind (which usually blows from March / April to October), because of shallow water and sandy bottom, because there are no bathers and because, during the summer season, there is a dedicated Kite Area. 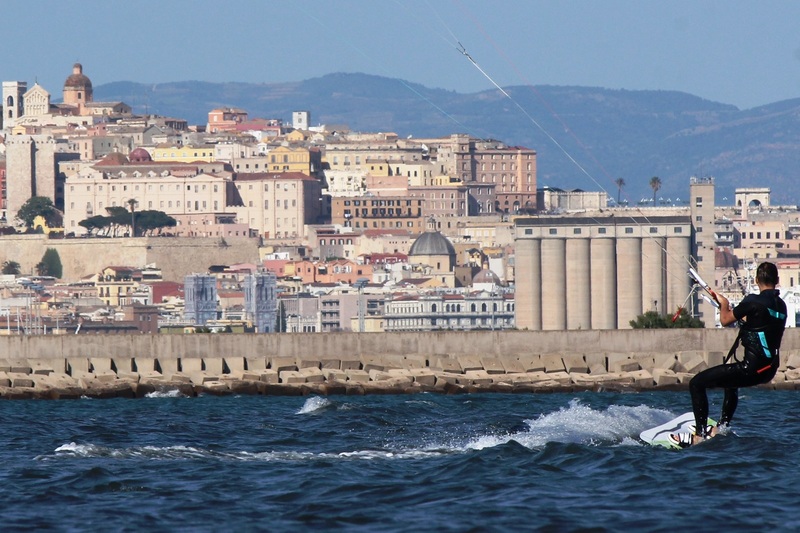 Giorgino is actually the only kitesurfing area in Cagliari where you can practice kite surfing in safety during the summer season without risking to have problems with bathers and authorities. The best wind is thermal wind that blows in absence of perturbations. Theaml wind usually blows constantly with an intensity between 12 to 18 knots. Other winds good for kitesurfing at Giorgino are all eastern and southern winds that sometimes could give even small waves. From Cagliari, take the “Strada Statale” SS 195 towards Pula – Chia. Immediately after the Scafa bridge (in Italian, Ponte della Scafa), there is the entrance to the first part of Giorgino, where is located the small and old “Fishermen Village“, famous for the fish Festival that takes place every September. To get to the Giorgino Kite Area, you do not have to turn to the Fishermen Village but you should continue along the SS 195 until the road passes from 4 to 2 lanes. Right here, on the left you could find the Giorgino Kite Area. You could click here in order to be redirected to the Google Map of Giorgino Kite Area. 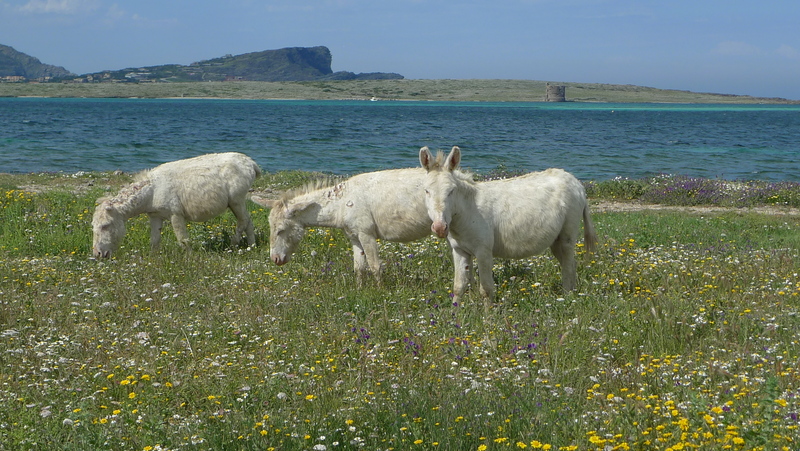 I like the idea of discovering the Wild West of Sardinia. But will the wind conditions be good to kite there this time? Mostly Mistral is working on the West coast. I’m looking forward to finding the exceptions, together withfortress en route to Stintino the less-known spots. he wind is luring me to Sardinia’s south-west – a corner of Sardinia which is going to elate me as a kiter and lover of islands; there are even two offshore islands, Sant‘Antioco and San Pietro. 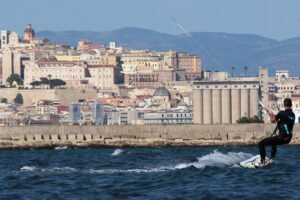 I am tempted to go for the road via Cagliari through the mountains – a dream for kitesurfing mountain enthusiasts – and via the quaint mountain village Teulada. Funtanamare near Gonnesa is the wave spot of the region with Mistral and south-westerly wind (Libeccio). The area is famous among kiters mainly because of its wave spot Capo Mannu, with winds from Funtana Meiga – Mare Mortowest to north-west. I’m heading for Funtana Meiga, which turns out to be a ghost town during low season. Despite wind forecasts: I’m spotting kiters! Yet not at the sea facing coastline of well known Funtana Meiga. Surprisingly, I find best flat-water conditions in the lagoons of Stagno di Cabras and the Mare Morto in front of them. Just turn left en route to the relicts of the antique town Funtana Meiga lagoonsof „Tharros“ and follow your nose, looking for paths direction lagoons and Mare Morto. There are no signs, but you can see the kites from afar. Don’t let yourself stop by drive-through constraints such as rocks; tracks indicate that driving through is possible. The locals in the restaurants on the way to Tharros Funtana Meiga lagoonsare also helpful. By the way, this is how I found my private accommodation. A few kilometres further north I’m surprised by the most amazing beaches; the MisMari Ermitral-beach Mari Ermi / Portu Suedda, and Putzu Idu. Kiters aim for Putzu Idu with Ponente and southerly. What can I say? 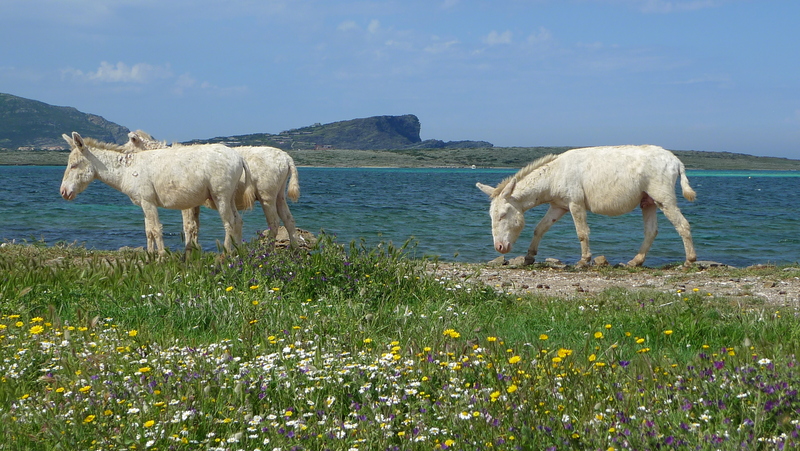 Sardinia’s Wild West! Never would I have Putzu Idudreamed of so many Caribbean style beaches and flat-water spots. It’s not only wild and unpredictable but it is still as well, and that’s what makes it so fascinating. A good contact for kitesurfer s is Lorenzo from thewindsurfcenter, which is situated at L’Approdo, the middle one of the three kiteable beaches around Stintino. This spot is named “Le Torrette“ because of the forts of II World War on the beach. In addition to winds described in the spot “Poetto”, here it is possible kitesurfing with Mistral that, even if off-shore and gusty, comes with a super flat water. The spot is not “workable” in the summer season because of the many bathers and the unavailability of kitesurf launch areas. From Cagliari, get Viale Poetto till the beach. From Quartu S. Elena, get Via Colombo, till the beach. Arriving from S.S. 554 or Villasimius, simply get Cagliari direction.